Ozarks dweller by choice, Radine Trees Nehring is a writer, news reporter, public speaker and teacher covering the Ozarks, its people, environment, nature and history. She and her photographer husband John discovered the Ozarks in 1978, and eventually left secure city careers for the uncertainties, surprises and delights of homesteading on their own 23 acres of wooded hills and hollows. Nehring's book, DEAR EARTH: A Love Letter from Spring Hollow--winner of almost a dozen writing awards--is the story of coming home to unspoiled nature. It's a heart-warming true adventure about love and learning, sorrows and joys, and also a practical guide to what life in the country can be like for a city-born couple who left it all--and found their dreams. It didn't happen because we were planning an escape. We didn't know we needed one. I did believe what Grandpa told me. He said it was important to love the land. To prove it, he bought a farm. Most people in the city would have said Grandpa was poor, at least if you were counting money. I noticed, though that his chickens had a bigger yard to run in than his city grandchildren did. On Grandpa's farm there were pastures, woods, and a creek. Playing at the farm on weekends, I began to think like Grandpa: "The land is wealth." When I was five, my father dug up part of our backyard and planted a vegetable garden. I followed behind him in the freshly turned dirt and helped push bean seeds out of sight. A few days later I saw the bent stems of bean sprouts backing up out of the ground, pulling casings and embryo leaves behind them. Even in the city the earth was full of miracles. I think the real reason it happened, though, is that John and I are dreamers. We have both known that for a long time. When we first married, many people were talking about going back to the land. John and I read books about homesteading. The idea of living in the country sounded romantic, but homesteading made us think of cutting firewood with an ax and milking goats. Neither of us wanted to milk goats, and we were trained for city jobs. How could we live in the country? I compromised. We dug up a square in the backyard and I planted tomatoes. My few tomato plants, protected and fed by chemicals in bottles, eventually expanded to two hundred square feet of organic garden with all kinds of vegetables growing in manure and compost. One summer when vacation time came, John and I drove east. We were looking forward to L. L. Bean and all the lobster we could eat. We found a log cabin on the coast of Maine, and sat on its porch dressed in jeans and T-shirts, looking out at acres of forest and a patch of blueberries. As we sat there we began talking about owning a log cabin and living in it, and about what kind of jobs we might find. Two weeks later we drove two thousand miles so we could put on our oxford-cloth shirts and go back to work in the city. When I think about it now, the three weeks each summer when we were pretending are clearer and more real to me than any of the other forty-nine weeks of the year ever were. One April we went on a weekend camping trip in the Ozarks highlands, one hundred twenty-five miles from our home city. We came to the campground after dark on Friday. In the morning we woke up in a grove of dogwood trees in full bloom. We sat together in the open door of our van and looked out at acres of dogwood blossoms, and we began talking about buying land, and about building a cabin, and about what kind of jobs we might find When we went back to work on Monday we were still only one hundred twenty-five miles from the dogwood grove. Four weeks later, an Ozarks real estate agent showed us the tree-covered hillside that tilted down into a hollow holding a spring and a tiny creek. The hollow was filled with dogwood trees. The following Saturday we were signing papers at the bank. On the first of June our place had a name. 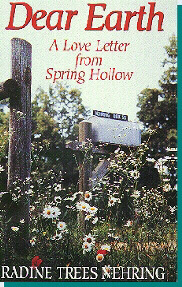 We called it Spring Hollow.